Dr. Ernie Ward discusses the importance of taking your new puppy to your veterinarian. Congratulations! Sharing your home with a new puppy is one of the most exciting – and rewarding – relationships you’ll ever experience. As a practicing veterinarian for over twenty years, nothing thrills me more than witnessing the unbridled joy and enthusiasm a new pet parent exudes. It’s contagious! To help you and your new bundle of bliss establish a lifetime of healthy habits, I’ve assembled my top reasons a puppy’s best friend is your family veterinarian. 1. Just because I look healthy, doesn’t mean I can’t be sick. As a practicing pet doctor, I’ve learned you can’t judge a pet’s health by its furry cover. If you’ve just adopted a young dog from a shelter or purchased a pedigreed pooch, keep in mind that a medical professional needs to check out your puppy as soon as possible and no later than a day or two. Your vet will begin by carefully checking out the heart and lungs for any congenital problems, the eyes for signs of infection or vision problems, and the limbs for any developmental defects. Your puppy’s first physical exam also establishes important benchmarks for future evaluations such as quality and composition of the skin and fur, body condition score, teeth and oral cavity, as well as behavior. I recently examined an adorable Maltese that was hugging and groping Mom as she entered my exam room. Mom recounted how much fun Shelby had been over the past two weeks since she’d brought her home. During my exam I discovered a tiny tuft of hair missing behind her right ear. Mom thought it was from fleas. Wrong. That teeny bald spot turned out to be ringworm! Guess who contracted ringworm on her neck the following week? Both Mom and her husband (who was not too happy). Don’t wait two weeks. Problems don’t. Seeing your vet soon is also important because many viral infections aren’t apparent until the infection is advanced. Your veterinarian is trained to spot deadly contagious conditions such as parvovirus, distemper, hepatitis, and more. If there is any doubt a pup may have an infectious disease, your vet will conduct special tests during the first visit. Keep in mind that most of these diseases are highly contagious to other pets. I’ve seen many entire litters wiped out simply because the owner lagged in getting to the vet quickly. 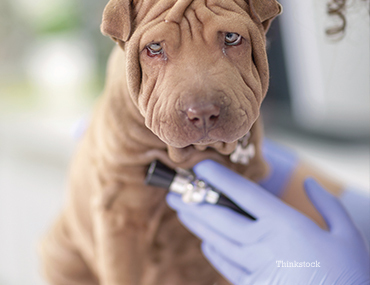 Your pet’s first vet check can literally be a lifesaver. 2. You can get worms from your dog. Disgusting as it may be, the fact is that your new too-cute cuddly canine may be hiding a bag of worms underneath that downy coat. Intestinal parasites or “worms” are extremely common in young puppies and are often an even bigger problem in dogs a few months old. Many of these creepy, stringy, gut-hugging bloodsuckers are passed from the mother dog during birth or when nursing, long before you fall in love with your puppy. One of the first and most important tests your vet will perform is an intestinal parasite exam. This test identifies any intestinal parasites or infections before they have a chance to cause serious medical problems for your pup or inadvertently infect other pets or human members of your family. No joke; this is serious. Thousands of children each year become blind as the result of the common dog roundworm that infects humans by channeling through the skin or is accidently ingested from dirty hands. My best advice is to schedule an appointment with your vet’s office on the way home from the shelter or breeder; that way you won’t run the risk of your dog spreading problematic parasites in your yard. Your vet will then prescribe lifelong strategic deworming medication, often combined with heartworm preventive, to protect both your pets and your family. 3. A few fleas can multiply into thousands – in a day or two. Another good reason to book that vet visit when you pick up your pup is to prevent flea infestations in your house and yard. Those live miniature vampire insects are sucking your pup’s blood, potentially transmitting diseases, and are just plain revolting. Your veterinarian will apply puppy-safe flea treatments to rid your pet of any external parasites. The cool fact is that these modern medications kill every single bug within minutes. Minutes! Don’t risk starting a war with fleas in your house or yard this year by starting your new pet on safe and effective flea preventives on Day One. Once started, I typically recommend year-round or nearly year-round flea prevention for all dogs. I’m especially fond of preventives that kill fleas, intestinal parasites, and prevent heartworm disease in one convenient and cost-effective tasty package. 4. Blood tests are a vet’s crystal ball. Perhaps nothing is more valuable to a veterinarian than a pet’s blood and urine tests. This is because the routine blood tests allow us a glimpse inside the body’s functions; tell us if organs are functioning properly, if hidden infection is present, and if the immune system is healthy. As a pet doctor I can guess if a pet is healthy by performing a thorough physical examination. I can know for certain with a few key blood tests. A doctor simply can’t determine how the kidney and liver are functioning, what the pancreas is or isn’t secreting, if blood sugar is too high or low, and a host of other essential body systems without diagnostic blood tests. I prefer to get baseline blood values during the first visit and certainly the first year to enable me to detect any slight future changes that could be an early signal to disease. I recently saw a bouncy Border terrier for increased thirst and having accidents in the house. At two-and-a-half years old I immediately suspected a urinary tract infection. I ordered routine blood and urine tests. When I compared his kidney test results with his puppy baseline values, I saw an upward trend. Still normal but increasing. We repeated the tests a month later and confirmed kidney disease. If I didn’t have baseline tests to compare to, I might’ve never diagnosed the kidney problem until much later. The owner may have mistakenly believed her dog had forgotten it’s housetraining. In fact, I often wonder how many dogs are incorrectly diagnosed with “behavior problems” when a medical cause is the culprit? Things have stabilized with a therapeutic diet and nutritional supplements but we’ll be keeping a watchful eye from now on. You might say whenever I look at a blood vial, I’m looking into my very own high-tech crystal ball. Heartworm disease is still one of the major killers of dogs in the US. It doesn’t have to be. One of the most important reasons to get to your vet quickly, especially if you adopt a dog over six months old, is to make sure your dog is heartworm-free and to begin protection. Heartworm disease is transmitted to dogs by mosquitoes and is found throughout the continental US. This means that much of the country is at risk of heartworm disease year-round. Prevention is inexpensive, easy to give, and more recently combines with flea and intestinal parasite preventives. There is treatment available if you adopt a heartworm-positive dog, although it can be costly and does carry risk. Untreated, well, I think you know how that story ends: slowly and suffering. With heartworms it truly is an ounce of prevention is worth a pound of cure. 6. What should I feed my puppy? This is the question on every new pet owner’s mind. The most important decision you make each day for your pets’ health is what you chose to feed it. Begin a lifetime of wholesome choices by having this conversation with your vet during the first visit. Few things affect health and prevent disease as much as diet. Your veterinarian is trained in pet nutrition and is expert in helping you decide on what bag or can of food is best for your pup. Pooches. Even better, your vet can advise you on modern nutritional supplements that can aid in proper physical and mental development of fast-growing pooches. Before you waste money on junk food and treats, visit your vet and have this crucial conversation. If your vet doesn’t bring nutrition up, ask them, “What should I feed my puppy?” If you don’t get a good answer, well, let’s just hope you do. If not, you let me know and I’ll talk to them. 7. Good behavior begins early. My last top reason for your pet to visit your vet quickly is to start basic behavior and manners training. Good behavior begins the minute you bond with your pup. Talk with your vet about teaching “sit,” leash walking, “come,” and how food puzzles and activity centers can stimulate your pet’s personality and brainpower. Enroll in a puppy socialization and training class; make every interaction a learning opportunity. Your vet can provide you with everything you need to teach your puppy what it needs to be the best pet ever. 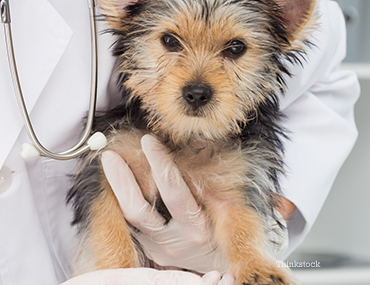 There are innumerable reasons to visit your vet as soon as you get a new puppy. These are seven solid suggestions that should be considered when you welcome home a new pet. Good luck and get started on a lifetime of healthy habits!